Taking A Break! | Read.Write.Discuss.Repeat. 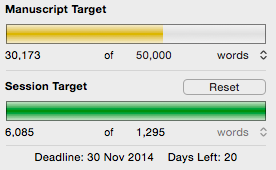 Quality blog post re: this years NaNoWriMo. Okay, phew. That was one hell of an intense day of writing. I’m actually going to stop myself instead of pushing on despite the fact that I could easily keep going. I think if I give myself the remainder of the evening to think on it and sleep on it as well, it’ll be better for tomorrow! Not only that but when I look at the walls of my room, I am pretty sure all I see is the Matrix. An early night never hurt anyone. ← Oh editing, how I love and hate thee so.